“Bombs don’t know if you are Jewish or Arab,” said Yael, the teacher of a high-school in Jaffa, south of Tel Aviv. For the first time in November 2012, several rockets were aimed at Tel Aviv and Jaffa, launched by militant groups in the Gaza Strip against the Israeli enemy, usually intercepted by the Israel Defense Force (IDF). But did these rockets really differentiate between the poor Palestinian suburb of Jaffa and the rich Israeli city of Tel Aviv? As we were frantically trying to locate the nearest bunkers, my Palestinian neighbours in Jaffa and I were very sure they probably would not. Neither the Israelis or the Palestians living in Israel expected that those handmade qassam missiles could reach the “white city”, Tel Aviv – the central and modern economical capital of Israel. As to our neighbours: the father with a chronical disease in his legs, who mostly sat at home watching Islamic prayers in Mecca on TV; the mother who was always out working in a kindergarten, and the four youngest kids going to school. The youngest kid, Mustafa, was always looking for interactions with us, “the foreigners”. Once, it was Yom Kippur and nobody was allowed to drive in Jaffa, and although it was a Jewish holiday, he knocked on our door. He asked for our help to fix his malfunctioning bicycle, as his father couldn’t do it and all his friends were going out. A few weeks afterwards, he asked for supervision on his English homework. We took a video of that unusal afternoon: my partner, an Israeli Jew, helping a muslim Palestinian kid doing his English homework, communicating in a sort of Hebrew-Language and with hands, while I recorded them. The best character of their family is the grandmother. She was born in 1948 and she was even more special because everyday she prepared an arabic coffee (in Hebrew, Turkish coffee) for us, knocking on the door promptly at 9 o’ clock. During the difficult time in November 2012, I lived with my partner and daughter while I was researching for my PhD project in “Mixed Education”, volunteering in several kindergartens and associations and interviewing in different schools. Most often at that time my partner studied photography, whilst our daughter was at school and I was conducting interviews or observation for my project, but it so happened that my daughter and I were to be alone at home everytime the 60 seconds alarm, that gave us the time to look for a bunker or hide under the stairs, went off. Every time it happened the door of our Palestinian neighbors was open and we shared those silly crazy moments, waiting for the end of the alarm, watching TV to understand where the missile landed. As of last week it was exactly one year since I lived in Jaffa, and Leila, the second daughter of the Palestian family, announced her engagement and marriage next year. She has invited us, as she says she looks at us as part of their family. She told me: “You remember, how much we were scared about the missiles! We even called the municipality to ask them where the nearest bunker was and they said that the nearest one was broken, so we had to go to another one that is about one kilometer from here! That’s crazy!”. This is quite typical in Jaffa, not everything is working. This city was always described by foreigners and travelers as a truly open harbor, “the bride of Palestine,” ever ready to welcome foreigners and famous all over the world for its oranges and grapefruits. It used to be a cultural center with newspapers such as Al Filastin and was connected by the first train in the area to the religious, mystic city of Jerusalem. This was until 1948 when most of the inhabitants died or left. Today Jaffa is included in the Tel Aviv municipality and considered a poor and problematic periphery of Tel Aviv. Jaffa is mainly inhabited by Palestinian citizens of Israel (Arab Israelis), new immigrants (religious or not) and low-middle class Israelis that cannot afford real estate prices in Tel Aviv. 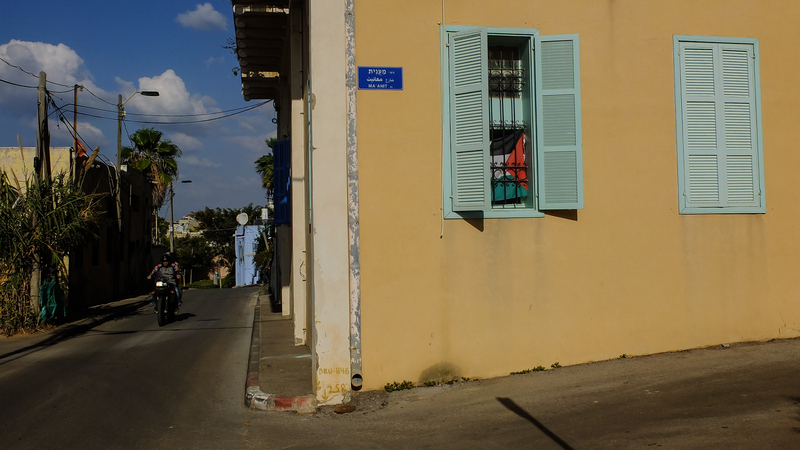 There are also a few fenced luxury residential projects where intellectuals, artists and politicians bought houses in the contested neighborhood of Ajami inside Jaffa. This complicated social situation and particularly the gentrification issue create everyday conflicts so that criminality and violence are part of ordinary life there. When I visited the family once again, saying hello, and tasting the Arabic coffee of the grandmother, I had to remember once again the words of the teacher who told me that the bombs don’t care who they fall on. But I felt safe with my neighbors and maybe they felt safe with a foreigner – me. 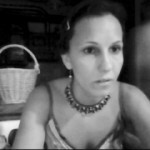 I’m a teacher and cultural anthropologist based in Italy. I’ve been living in the West Bank and in Israel several times focusing my research on the separation barrier and on mixed education in Jaffa. I really enjoyed your personal and political ethnography and look forward to read more about how you interweave your findings with your life, as this is part of the social fabric that makes the place ordinary and mundane as well as unique. I came across a fascinating documentary that rings many bells with this home-ground for Arabs and Jews alike in one family, called ‘Salata Baladi’ (2008) by Nadia Kamel. It is worthwhile watching for better understanding the socio-historic complexity that is lived by mixed families, neighborhoods and people in this context.